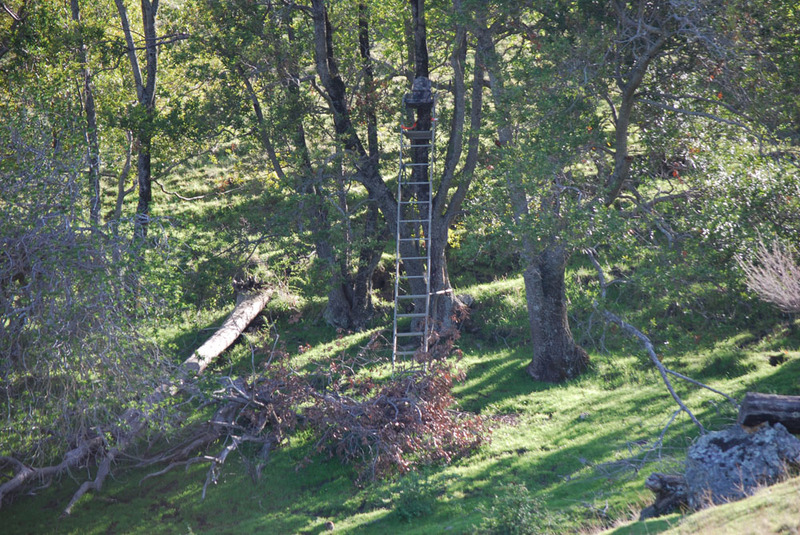 Hunting blacktail deer from a tree stand. Over the years I’ve hunted from a tree stand occasionally. The closest I’ve ever come to bagging a deer from a treestand came last summer from my current stand. A forked-horn buck walked past my stand and then turned towards me. He approached within four yards of my positon. He wasn’t a big buck, but at four yards, I decided it was about time I shot at something. Previous to that blacktail encounter, I had never taken a shot from a tree. I once carried my stand into the National Forest in Idano for a few miles and set up near a beaver pond. A 7X7 herd bull came in to my bugle and stopped broadside at 15 yards. Unfortunately, there was a large fir tree between me and his vitals. That same year, a spike bull came in to ten yards and fed around my stand, but I wanted something bigger. I believe I could have arrowed that bull. A nice bull moose also walked under my stand that year, but I wasn’t hunting moose. 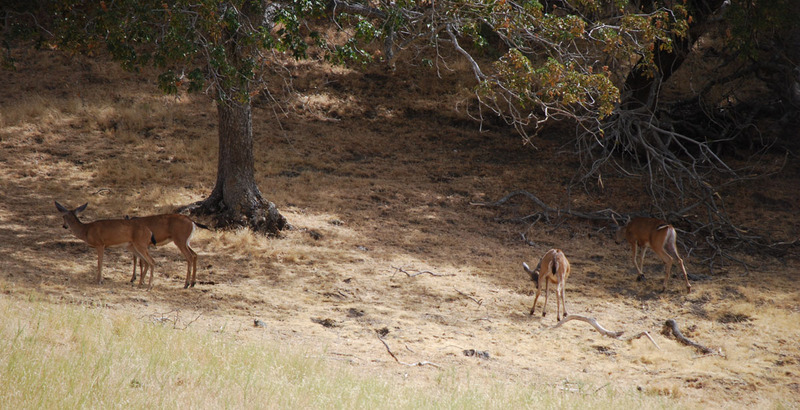 While hunting from my tree stand near Anderson Flat, outside Yosemite, I had a mountain lion chase a deer past me. However, until last summer I’d never loosed an arrow. From four yards I drew aimed and released. The arrow zipped over his back. I guess he was too close. This summer I’ll try again. Here’s a photo of my stand. There’s a pond about 75 yards down hill from the stand and in the summer heat, bucks like to drink from the pond and then walk up to the patch of trees to bed in the shade. I’m hoping to break my tree-stand drought this summer. Last month I set up my 3D target and practiced shooting from the stand. On my third shot, the limb of my bow hit the safety bar. It made a huge clank, and sent my arrow off line. So much for the safety bar. It is a little scarry for me when shooting down at close targets, but I have a good harness and safety system. I’m not as stable as I once was, but I’ll be looking for about a fifteen yard shot and that’s a range where they are most likely to pass. I’m better prepared this year. These deer are feeding under the trees next to where my stand is currently located. I’ll be ready if a nice buck arrives this July.